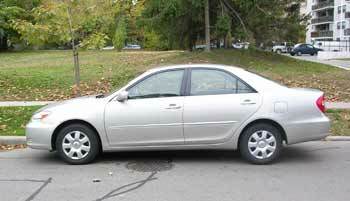 The 2002-2006 Camry (known as XV30) is a spacious mid-size family sedan with a soft smooth ride. A two-door version is sold as Toyota Camry Solara. The Camry has front-wheel drive and comes with a fuel-efficient 4-cylinder engine or a smooth and powerful V6. The interior is comfortable and roomy with plenty of rear-seat space. The dashboard is well laid out. The instrument panel is simple with large gauges. Front seats are cushy. A large trunk offers plenty of cargo space. The Camry holds its value well. Maintenance costs are below average for the class. Overall reliability is rated above average, but there are some trouble spots to watch out for. We've done some research on common problems, read more below. Toyota Camry problems: Suspension problems like bad sway bar links and bushings, rear control arm bushings and rear strut mounts are fairly common. The repairs are not very expensive. Oil leaks from the valve cover gasket(s) are often reported. The valve cover gasket replacement costs $80-$150 in a 4-cylinder engine and $200-$280 in a V6. Several owners mention a leaking water pump. If a bad water pump not replaced in time, lack of coolant may cause overheating of the engine. Front oxygen sensor (Air/fuel sensor) fails often; replacement is not very expensive. Lack of power, hesitation and "Check Engine" light with the code P0171 could be caused by a bad or contaminated mass air flow sensor or cracked rubber intake snorkel. The mass air flow could be cleaned or replaced. Unstable idle and stalling (often after battery replacement) could be caused by a carbon buildup in the throttle body. Cleaning the throttle body usually helps. A faulty A/C clutch relay in the under hood fuse box can cause the air conditioner to cut out intermittently with the A/C light flashing. Replacing the relay solves the problem in most cases; your Toyota dealer should have the part; it's not very expensive. There is also a number of complaints about stripped head bolts in the 2.4L engine; the repair is expensive. Powertrain: The base engine is the 2.4L 4-cylinder DOHC, model 2AZ-FE. 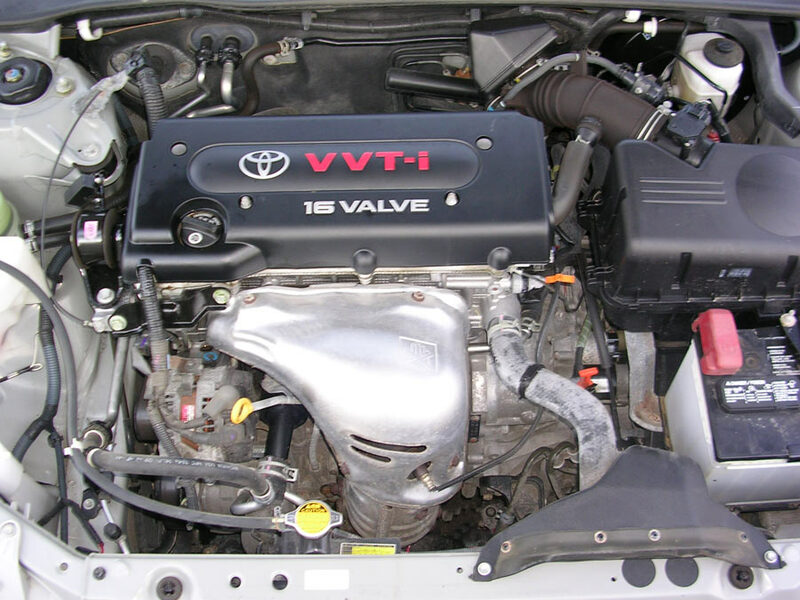 This engine was widely used in many Toyota vehicles, including the RAV4 and Highlander SUVs. The optional 3.0-liter 24-valve V6 is smooth and powerful. 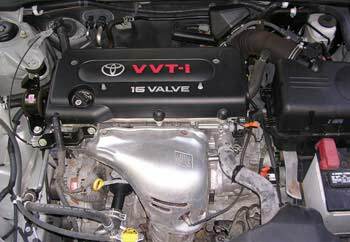 From 2004, the 3.3-liter V6 DOHC VVT-i engine became available on SE V6 model. A manual transmission is only available with a 4-cylinder engine. Timing belt or chain: The 4-cylinder 2.4L engine has a maintenance-free timing chain. Both 3.0L V6 and 3.3L V6 have a timing belt that needs to be replaced at regular intervals. See more information on the next page. Safety: Anti-lock brakes (ABS) were optional; standard from 2005. Side and side curtain airbags were optional on 2004-2006 models. The Insurance Institute for Highway Safety (IIHS) rated the 2002-2006 Toyota Camry "Good" for frontal crash protection, however models without optional side airbags received "Poor" rating in side crash test. See NHTSA crash test results in the table. Handling and ride: The Camry is a pleasure to drive, especially on the highway. The ride is very soft and smooth; road bumps and expansion joints are absorbed well by the suspension. The steering is very light too. The 2.4L 4-cylinder engine is pretty quick off the line and provides enough power for everyday driving; the V6 is strong and very smooth. The handling is good overall, but is not sporty by any means. Fuel Economy: The Camry is among the class leaders in fuel economy. The 2005-2006 automatic 4-cylinder Camry gets 21/31 mpg. This means that with mostly highway driving, you can get up to 466 miles (670 km) to a tank; the fuel tank capacity is 18.5 gallons or 70 liters. Pros: Good on gas (4-cylinder models), comfortable soft and quiet ride, roomy interior, spacious trunk, easy to maintain, resale value, above-average reliability. Cons: Front seats lack lateral support, paint scratches easy, poor scores for side crash protection without side airbags. Overall: The Camry is a natural choice if you are looking for a used family car. The 4-cylinder engine is good on gas; V6 is smooth and powerful. For a 4-cylinder model, consider buying an extended warranty, at least for the powertrain, as some engine repairs could be expensive. Make sure to have the car properly inspected before purchase. Consumer Reports rates Toyota Camry 'above average' for reliability. Competitors include Honda Accord, Mazda 6, Nissan Altima, Ford Fusion and Chevrolet Malibu. The Accord is also reliable, but has a firmer ride. Mazda 6 offers more sporty handling but is less roomy and a has wide turning radius. The Malibu is cheaper, but is not as reliable. What to look for when buying a used Toyota Camry: Checking history records will help avoid cars restored after accidents. If possible check service records; avoid cars that have been previously overheated. A blue or white smoke from exhaust, even if it's just a small amount at a startup, should tell you to avoid the car. 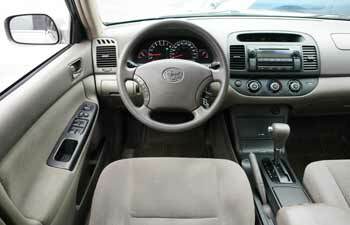 When test driving the used Toyota Camry, there should be no noises when driving over bumps or rough roads. Read more tips: illustrated used car checklist. Have the car properly inspected by your mechanic before buying. If during an inspection, coolant leaks are found at the back of the 2.4L 4-cylinder engine, avoid the car. Maintenance tips: Change your oil regularly; Toyota recommends using 5W-30 oil in both, the 4-cylinder and V6 engines. Watch out for coolant leaks and keep engine coolant topped up; overheating may result in very expensive repairs. Change transmission fluid when it gets dirty. According to the 2006 Camry owner's manual, an engine air filter and a cabin filter need to be replaced at 30,000 miles. The cabin filter is located behind the glove box. A timing belt in the 3.0L and 3.3L V6 engines needs to be replaced every 90,000 miles. Expect to pay $300-$450 to replace the timing belt only, or $500-750 if you want to replace the water pump too. Owner manuals - where to find online.